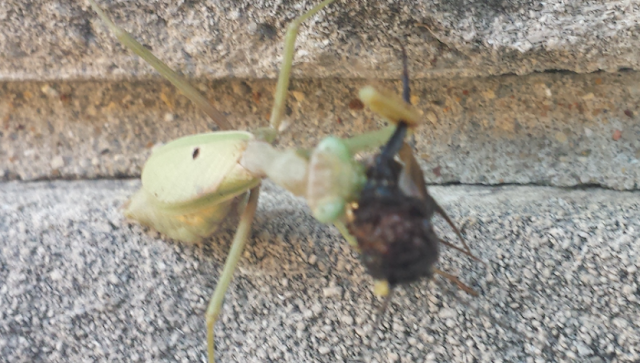 There have been a number of praying mantises all over town this past month. I've seen them on the sides of cars, on playground equipment and on lawn furniture. I encountered this particular praying mantis on my porch the other day and found him dining on a cricket yesterday afternoon. Unlike many other insects, the praying mantis doesn't inject its prey with a fluid that liquifies its internal organs. The preying mantis eats its prey alive. I'm not sure which of the two options I find more terrifying.